Over the past few weeks, many bloggers, journalists and research institutes investigating digital diplomacy have published their summaries of 2014. One such summary that attracted much attention dealt with India’s digital diplomacy achievements over the past year. While some have focused on the social media activity of India’s new Prime Minister and twitter celebrity Narendra Modi, others have examined India’s Foreign Ministry. On the 25th of December the Economic Times published an article detailing the success of Indian digital diplomacy. According to the article, ” On the microblogging site Twitter, @IndianDiplomacy handle, the official account of the Ministry of External Affairs, has as many as 276 thousand followers – larger than any other ministry”. Moreover, the Indian Foreign Ministry’s Facebook page has 700 thousand followers and it therefore “beats every other ministry”. These are by all accounts impressive figures. However, when evaluating digital diplomacy one may consider many different parameters. Currently, foreign ministries place an emphasis on the amount of followers they and their embassies attract on social media. Yet as Matthias Lukens of Twiplomacy says, it’s not always the amount of followers you have, but rather the quality of your followers. For instance, foreign ministries may boast thousands of followers, yet if they are not followed by other foreign ministries and journalists covering diplomatic issues than they are not reaching the right audiences. Likewise, one re-tweet may be more powerful than a hundred re-tweets. If a foreign ministry’s tweet is picked by the New York Times for example, then the ministry’s message may soon reach more than 14 million social media users. Yet I would argue that the true measure of digital diplomacy success lies not in the number of followers or even their quality. Rather, it lies in the foreign ministry’s willingness to engage with its followers on a daily basis. How Is Digital Engagement Practiced Today? Over the past year I have been continuously monitoring the Facebook and twitter activity of 11 MFAs throughout the world namely the US, UK, Israel, Poland, S. Korea, Japan, India, Rwanda, Somalia, Ethiopia and Kenya. One of the parameters I have been investigating is the manner in which these MFAs practice digital engagement . What I’ve learned is that, by enlarge, engagement is a rarity. When MFAs do engage with followers they do so at pre-defined times and deal only with pre-defined issues. Such is the case when Facebook followers are invited to a Q&A session with a US official regarding disability rights or when UK followers are asked to partake in a session dealing with the Syrian civil war. This form of engagement is limited to specific issues and short durations of time. But when MFA social media followers post questions outside these Q&A sessions, they seldom receive answers and when they post criticism they seldom garner attention. Thus, digital engagement with followers has been quarantined by MFAs. With the exception of one MFA- Kenya’s foreign ministry. It is Kenya that leads by example, it is Kenya that engages with followers on a daily basis and it is therefore Kenya that can boasts great achievements in 2014 summaries. How Does Kenya Practice Digital Engagement? 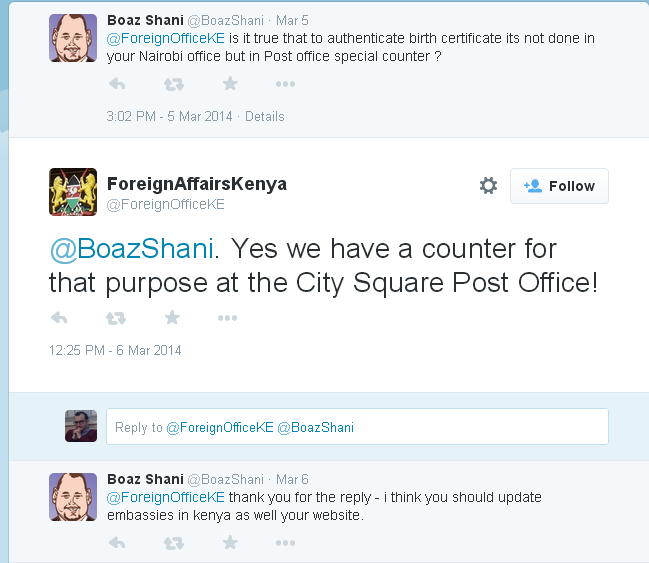 During the month of March 2014 there were many instances in which Kenya engaged with followers. One of the more important tasks of MFAs is dealing with consular issues. Below is an example of an MFA twitter follower who was in need of information regarding birth certificates. 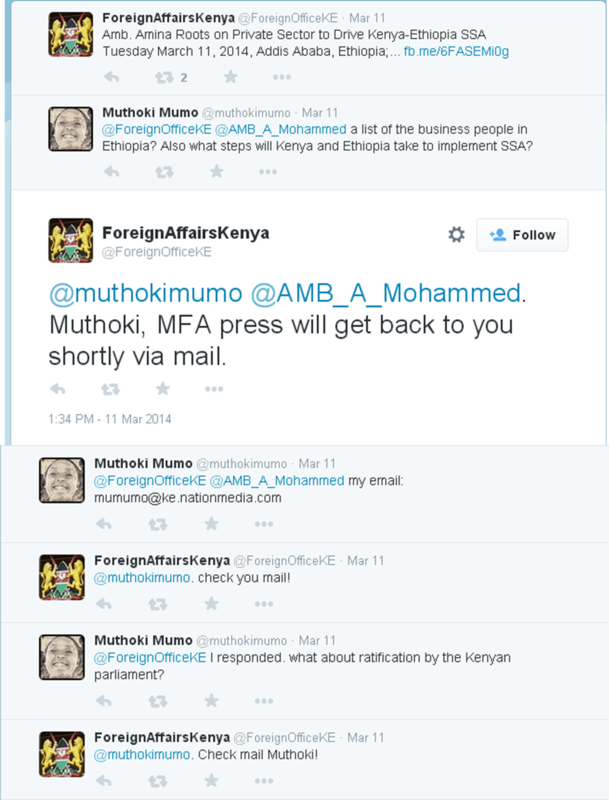 Within hours the Kenyan Foreign Ministry had tweeted a reply. On the 6th of March, the Kenyan MFA posted a tweet saying that the British High Commission in Nairobi was looking for a new Deputy Head of Communications. 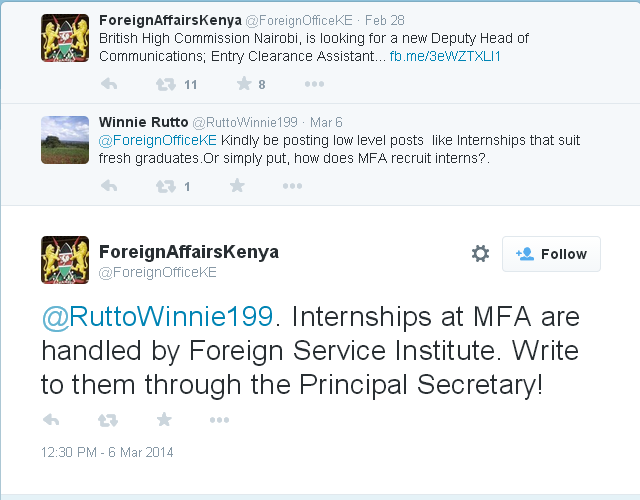 A twitter follower (apparently a student) soon asked if the MFA had information on internships at the High Commission. As can be seen below, the MFA replied the requested information. On the 11th of March, the Kenyan MFA posted a tweet dealing with a new Kenyan-Ethiopian economic initiative. A journalist soon posted a question regarding the initiative. As can be seen below, the MFA asked for her mail and proceeded to send her the requested information. 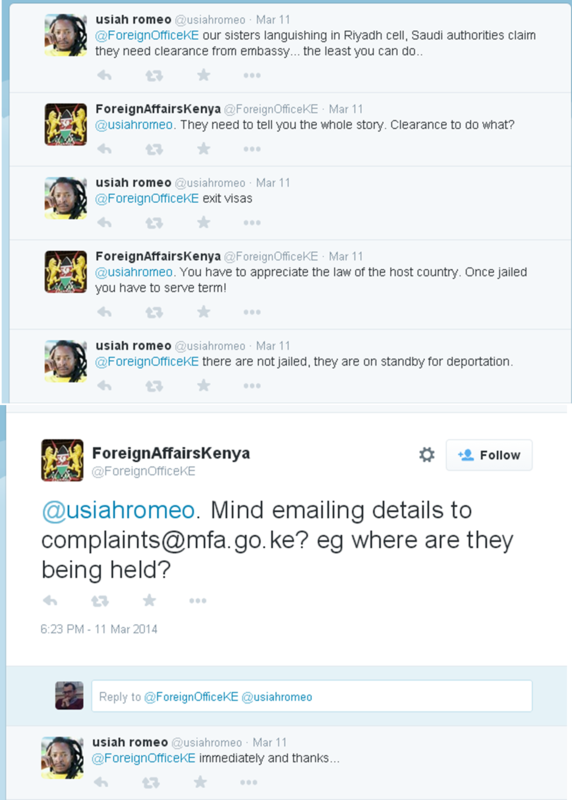 These examples all demonstrate that Kenya’s MFA now uses social media as a tool for engaging with two important audiences: the local population and journalists. However, it is the dialogue featured below from the 11th of March that truly exhibits Kenyan engagement. A follower posted a tweet according to which his sisters were jailed in Saudi Arabia. At first, the MFA replied that if sentenced abroad one must serve his term. But when the followers tweeted that the sisters were awaiting deportation and not serving time for crimes, the MFA immediately asked for information so that it could assist the follower and his sisters. It should be noted that such engagement by Kenya’s MFA was not limited to Visa issues or to the month of March but rather characterizes the daily working routine of the Kenyan digital diplomacy team. India’s social media presence is much more dominant than Kenya’s. On twitter, the Indian MFA has 292 thousand followers as opposed to Kenya’s 51 thousand. Moreover, while PM Modi has some 9.12 million followers on twitter, Kenya’s President attracts some 682 thousand followers. Even within the social network of Foreign Ministries, India is more dominant than Kenya. For instance, while India is the 7th most popular MFA among world foreign ministries, Kenya is the 69th most popular. But the question is not how many followers you have- but what you do with them. Albert Einstein once said that “not everything that can be measured counts and not everything that counts can be measured”. Engagement with followers counts and it can be measured. Therefore, it is engagement that should become an important parameter for evaluating digital diplomacy activity at the MFA and embassy level. If other MFAs wish to realize the potential of their online activity, and foster relations with their audiences ,they would be wise to follow my MFA of the year- Kenya. Posted in Uncategorized and tagged Digital Diplomacy, engagement, Facebook, Foreign Ministries, twiplomacy, Twitter. Bookmark the permalink.